The situation appeared to be turning in this direction after an attorney for We Care About the Square announced at a city planning board meeting last October that legal action was a possibility if the project wasn't sent out for new bids. Afterward, an official for Kirchoff said the company was still committed to the project, but there was also visible frustration. The project took another hit when the Troy Waterfront Farmers' Market announced in November it would no longer seek to occupy a large portion of the project's street-level retail space. The project had recently been stuck in a sort of limbo as the new mayoral administration of Patrick Madden decided whether to grant an extension on the development agreement for the site. This latest proposed project was first announced in February of 2014, and ultimately included one building with 75-80 residential units, 84 parking spaces on ground level, and street-level restaurant and retail space. It was the third major effort to build at the site, which had been cleared when Troy's former city hall was demolished in 2011. Just think of all the taxpayer dollars wasted "planning" this nonsense in cash-strapped Troy. Good bye, Kirchoff Companies. Good bye and good riddance. The original proposal was very attractive. But that design disappeared. What Kirchoff offered in its place was wholly unacceptable. Troy is well rid of it. I know the architecture snobs will disagree, but the old city hall looked better than this gaping hole. Imagine the horror of less-than-wealthy people occupying apartments in downtown troy. Thank goodness that didn't happen and we have a permanent vacant lot instead. Blech- The opposition for the 2011 plans came from the new administration that took over after that particular RFP was chosen, not from WCATS. The group was formed after it became apparent that Kirchoff & Co were trying to push through the cheapest building they could instead of what was presented in their original RFP design. Sean- Taxpayer money was wasted but it was in the form of state grants that were earmarked for the project to begin with. It looks like the only real loss to the city was a lot of wasted time and the entire purchase price of the site which, depending on who you speak with, was sold too cheaply. The city gets to keep the deposit which I'm sure they'll use wisely. And by wisely I mean they'll blow it all on consultants for various studies that will never be used. We're nothing if not predictable. Is it a new trend where developers propose something and then try to get away with building something completely different? Or is it just happening closer to home so I'm finally hearing & caring about it? 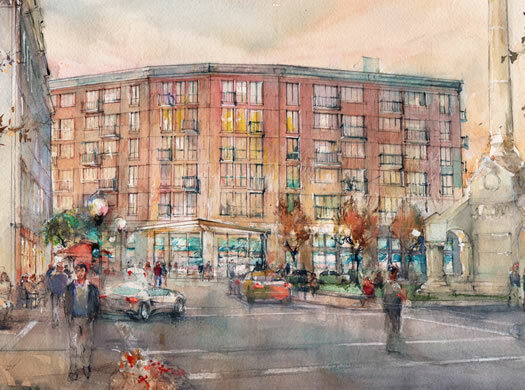 There has been the Casino case in Schenectady, this, the (former) Moore Hall project in Saratoga which is ongoing. I've also heard about a less publicized battle also in Saratoga over a barn restoration, where the developer got all kinds of conditional variances to do it, and began systematically swapping out pieces to build an entirely new structure. It feels like the same crap that gets pulled in politics and finance. A fine, and maybe a verbal thrashing in exchange for doing whatever they want. Loved the art work involved for Monument Square picture! Reminded me of French Impressionist style.